Metallica may be back on form with the just-released Death Magnetic, but MusicRadar users have decided clearly that 1986's Master Of Puppets is the band's greatest album. 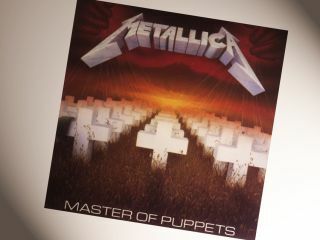 Over 1500 users have voted in the last week - Metallica Week on MusicRadar - and Master Of Puppets took 44% of the vote. Poll question: Which is Metallica's best album? "Master Of Puppets set the benchmark for what heavy metal could achieve and it's not surprising to see it come out on top by such a large margin," says Laing. "I'm a …And Justice For All man myself and I hear more of that album's influence in Death Magnetic than Master Of Puppets. "However, as far as production goes, Metallica have still not bettered their sound on Master Of Puppets - and 22 years later some would argue that Rick Rubin's engineers should have taken note of it when mixing Lars' drums on Death Magnetic!" So does Death Magnetic compare? Here's our original MusicRadar verdict. Now Death Magnetic is in the shops, what do you think?